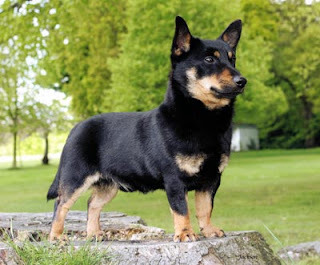 The Lancashire Heeler was developed during the 1960s in order to herd and drive the cattle and sheep. They also had the ability to hunt and catch rabbits and cats. Presently it is used as a working dog as well as a companion and is rare in North America. It has also been listed in the list of endangered breed by the Kennel Club (UK). They are very loving and devoted and are best in a home with mature children. They also get along with other animals including dogs. Moreover, they are cautious around strangers and will warn their family about any coming visitors and threat. They need to be brushed once a week using a wire brush and bathing should only be done when needed. It is a double coated breed and sheds every spring and fall. They must be socialized and trained for obedience at a young age with the training methods being just, firm and constant and not harsh. The handler must be dominant because they can are headstrong and troublesome at times. They enjoy walks, running and romping in a fenced yard, herding and family plays but can even survive in an apartment if they are given enough activity and mental stimulation.